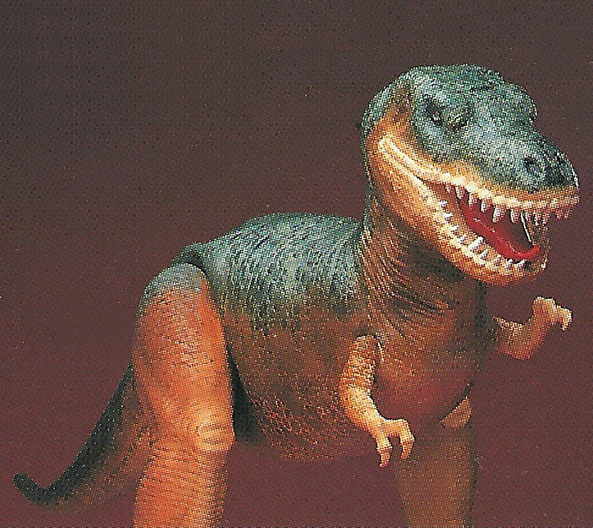 The pre-production box shots for both the Dino-Rider and Rulon versions of the Deinonychus depict a solid tan color dinosaur. 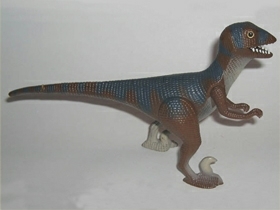 The actual released pieces are two toned with stripes running across the back of the Deinonychus. 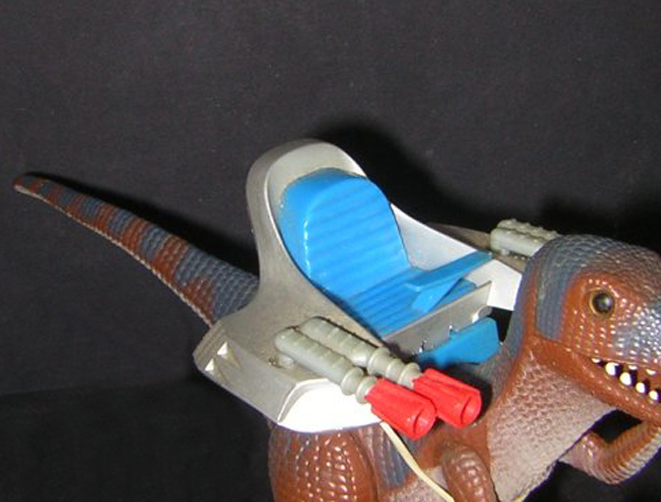 Both the Dino-Rider and Rulon versions of the Deinonychus have the same brown base color but the Dino-Rider version has blue stripes on its back whereas the Rulon version has dark brown stripes on its back. 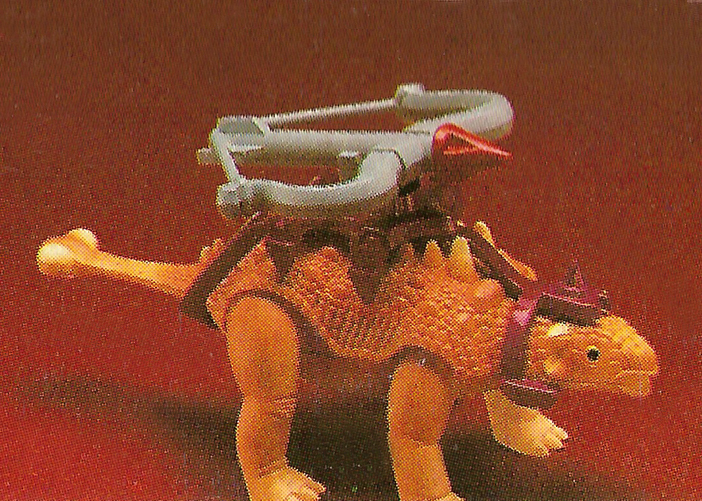 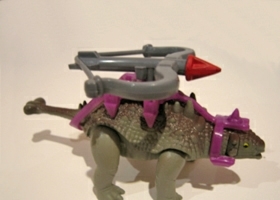 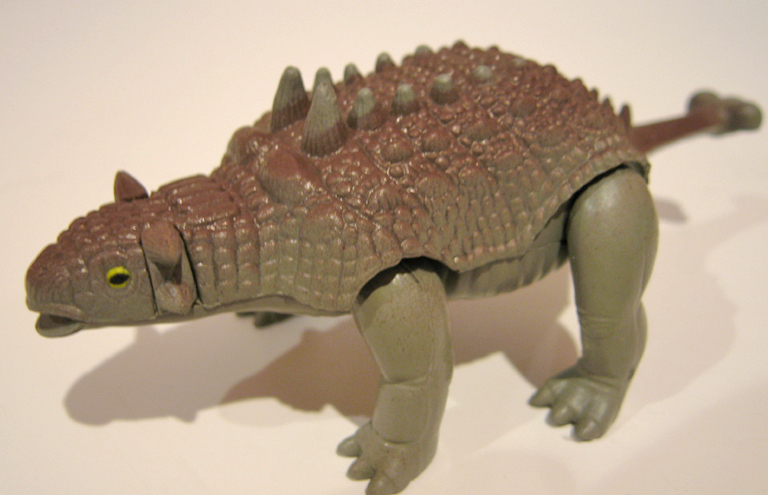 The pre-production box shots depict an orange colored Ankylosaurus. The actual released toy is a light gray and brown. 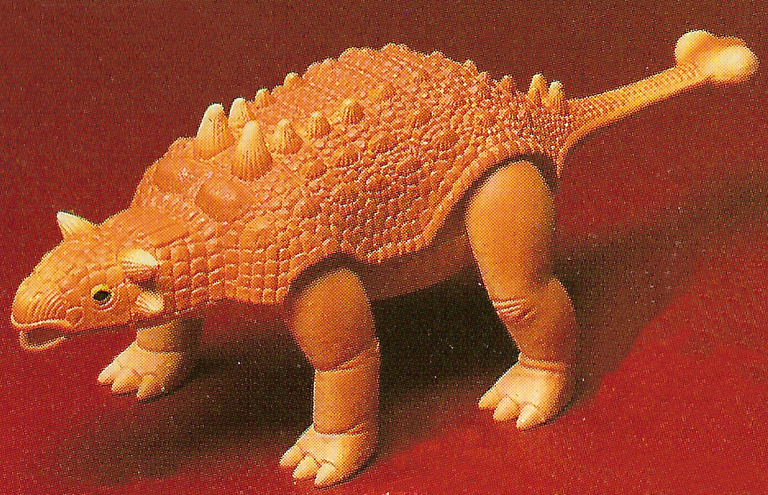 As one of the smaller dinosaurs produced, the Ankylosaurus is a very simple piece and isn�t as memorable as most of the other pieces. I personally think releasing the orange version would have been better as it could have brightened up an otherwise boring toy. 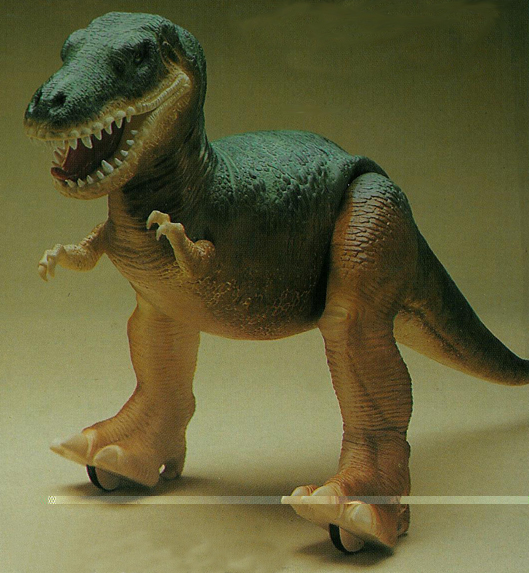 By far the most egregious and disappointing use of the �Colors May Vary� disclaimer is the T-Rex. 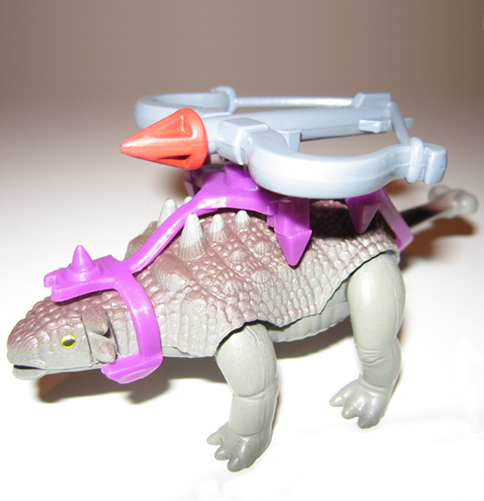 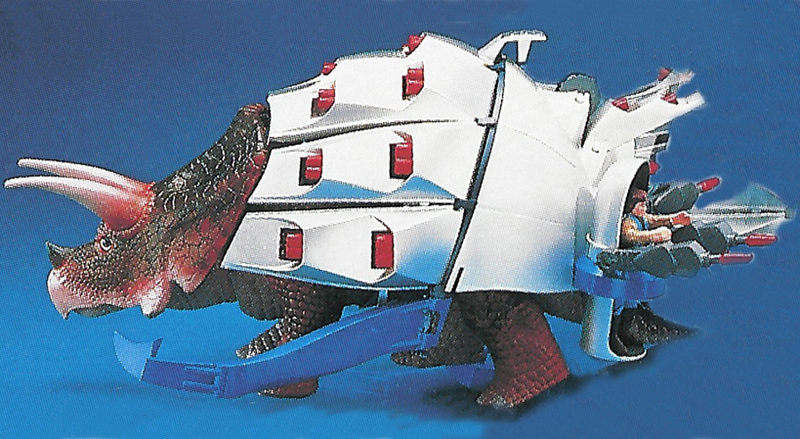 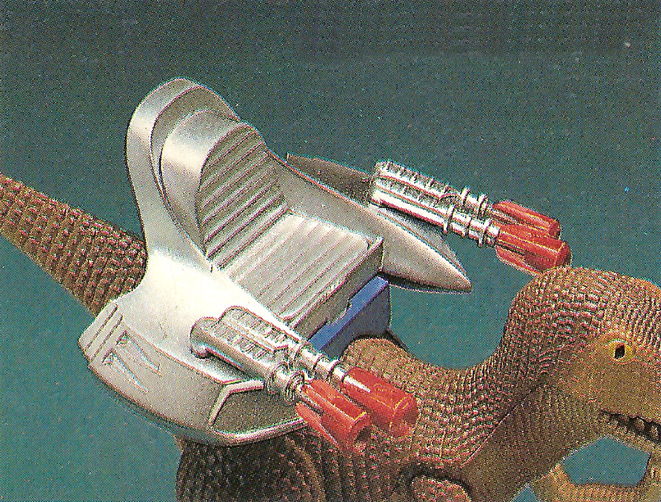 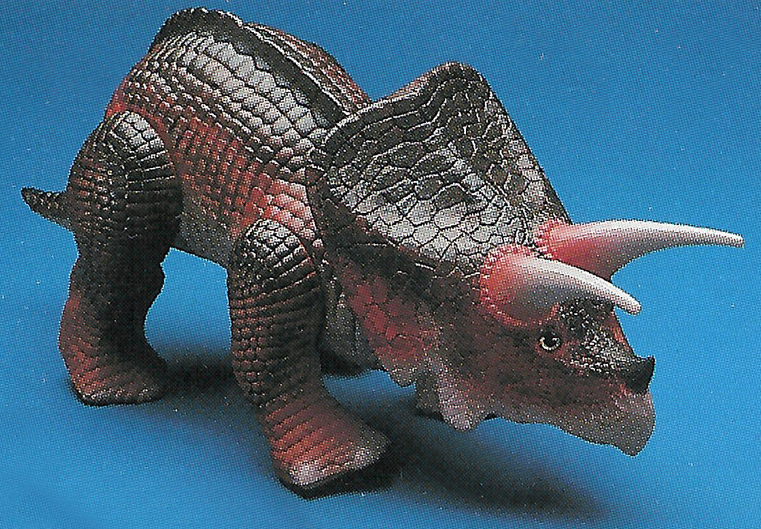 Instead of the green and orange T-Rex that personifies the Dino-Riders theme, we were instead given a dark charcoal gray T-Rex that left a lot to be desired. 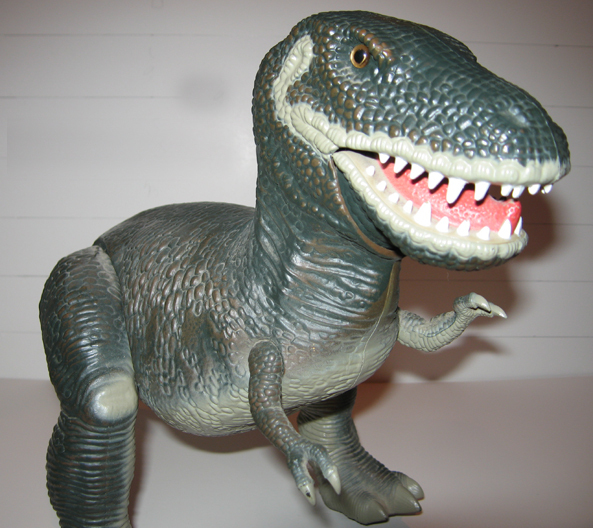 It�s odd because every comic book and cartoon episode always depicted a green and orange T-Rex. 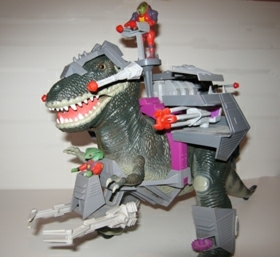 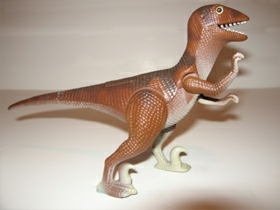 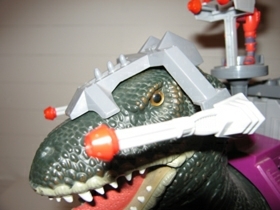 The only gray T-Rex that we ever saw was in the second series picture. Even the box and the catalog in the back of the mini comics show a green and orange T-Rex that looks infinitely cooler than the one actually released. I don�t know the reason why they didn�t just paint it to match the cartoon, except for maybe cost reasons but then again how much more could it cost to paint something green and orange instead of gray? Even in the Smithsonian Institution re-release, we were still given the same dark gray T-Rex. 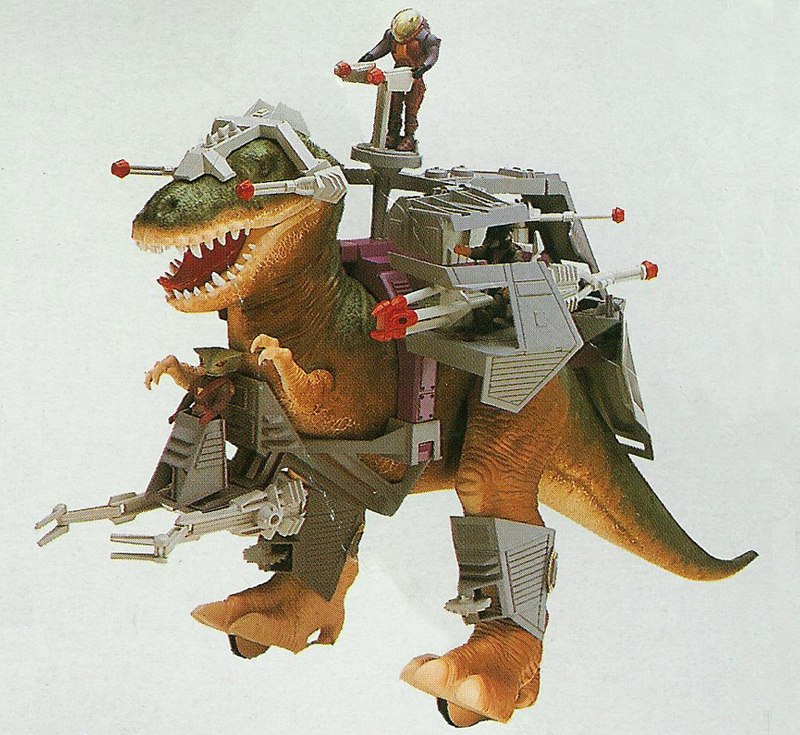 Tyco really dropped the ball on this one. As cools as the T-Rex was, it would have been fifty times cooler if it came in the right color. 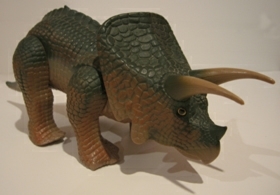 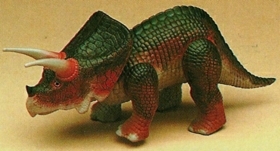 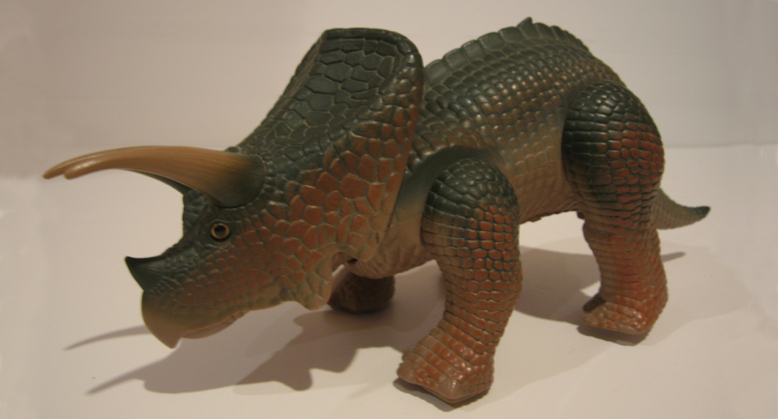 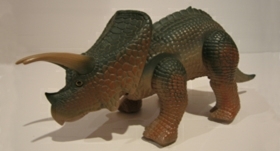 The pre-production box shots depicted a bright red and black/dark gray Torosaurus but instead the final version was a dark green and brown. Overall, the color scheme depicted in the box art looked cooler than the actual production version. 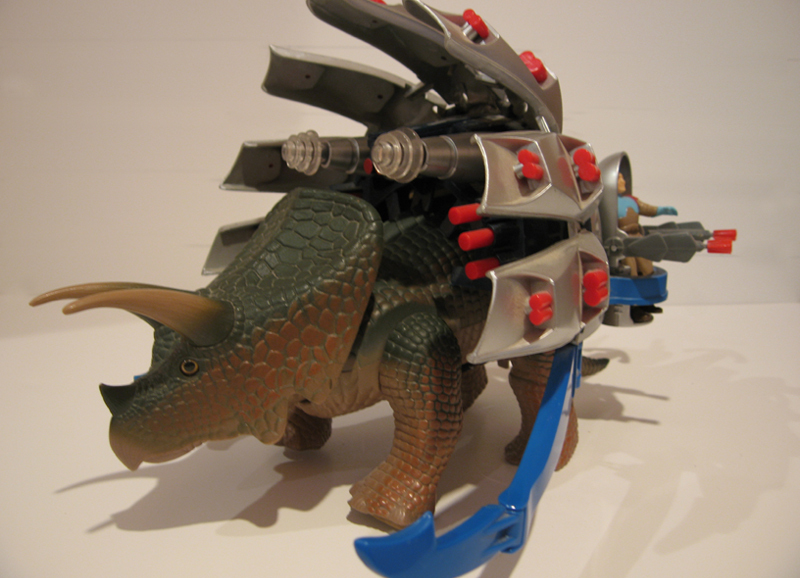 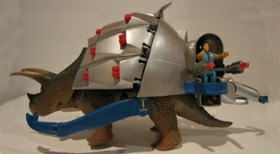 However, because the armor basically covers up the entire dinosaur, in the end it doesn�t really matter all that much. 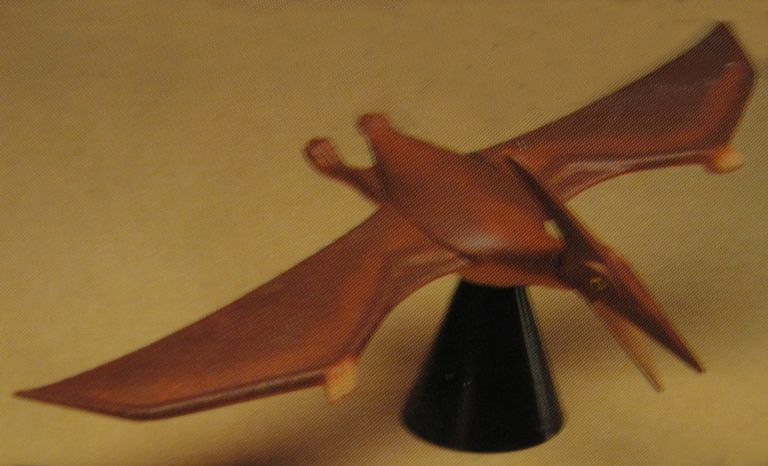 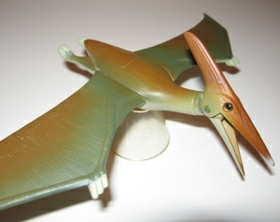 The pre-production box shots depict a solid brown colored Pteranodon but the actual released toy is slightly different, with a dual brown and dark green color. 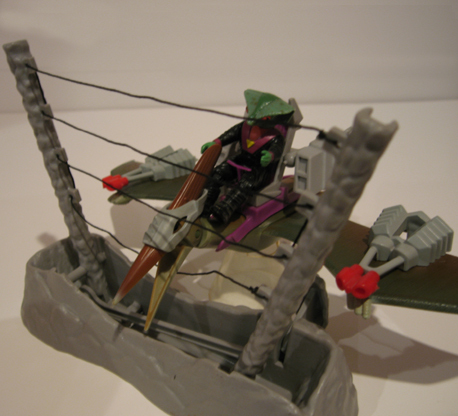 Also, the box depicts a tan colored Rulon net trap but the actual released trap is gray. 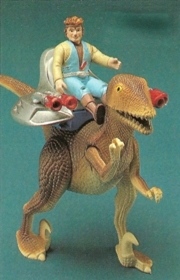 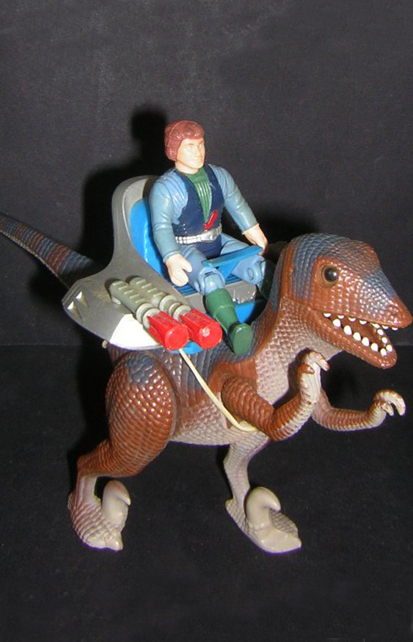 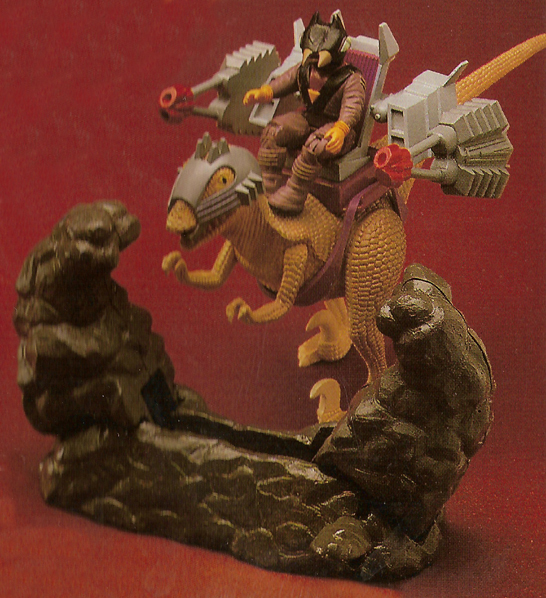 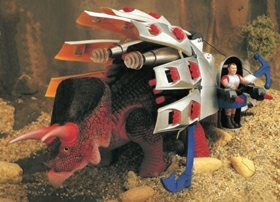 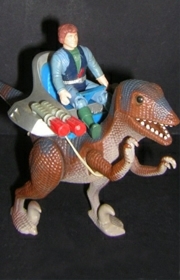 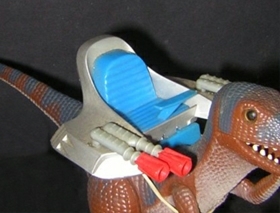 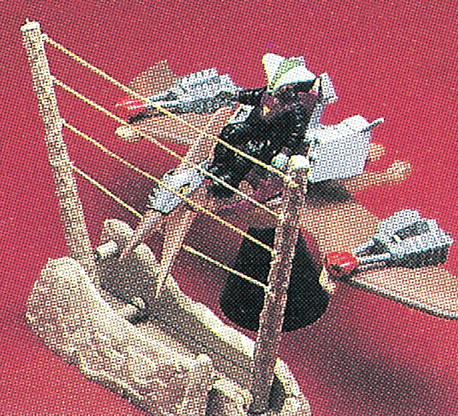 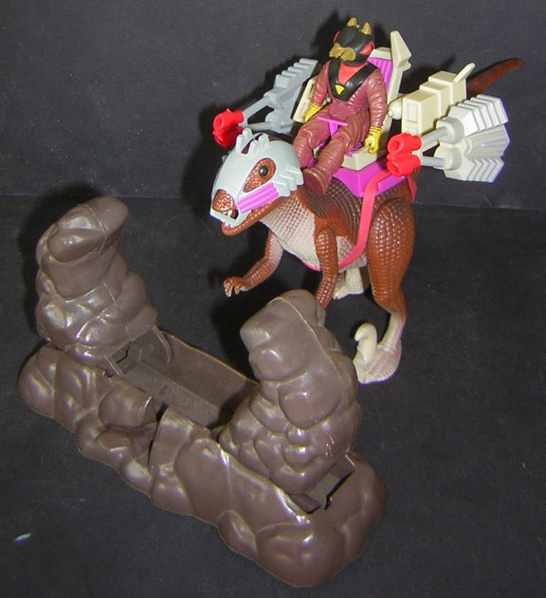 Sky, the rider on the Dino-Rider Deinonychus, varied from its actual production piece. 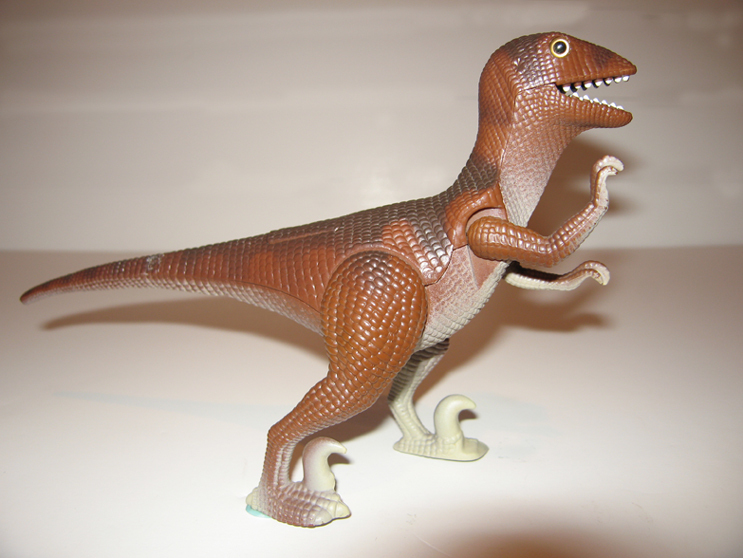 Both the box art and the toy pictures on the box showed a different figure than the one that was actually released with the Deinonychus. 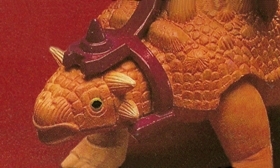 The box depicts Sky as having light brown hair with a light blue suit and tan shirt, which is actually the same color scheme as Magnus, the figure that came with Torosaurus, except with a different head sculpt (the figure on the box had a headband, whereas Magnus did not). 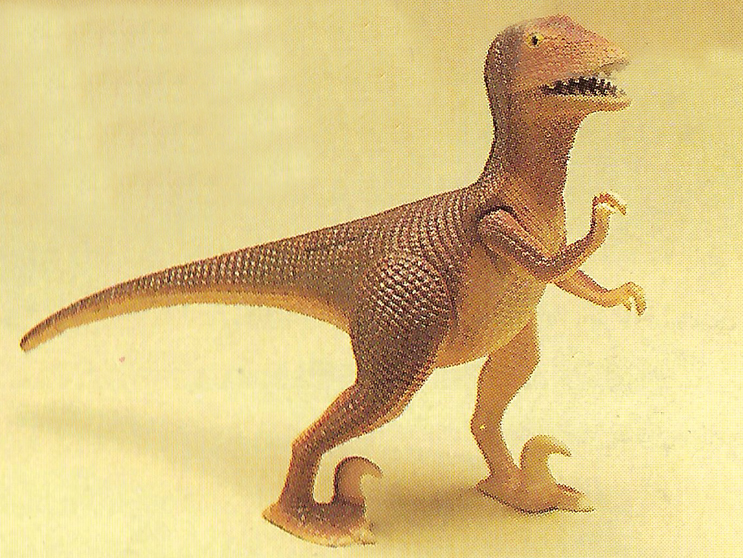 The actual Sky figure included with the Deinonychus had dark brown hair with a dark blue suit and light blue shirt. Adding another twist is that the box of the Japanese version of the Deinonychus showed yet another figure � one with dark hair and a silver and blue outfit (this is actually Proto from the Series 1 two-packs). The back of the Series 2 mini comic and some of the catalogs depicted a Kanon figure with blond hair. 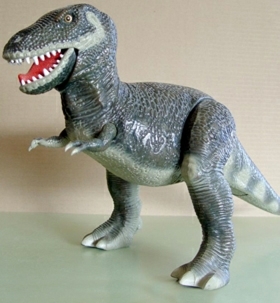 The actual production figure had gray hair. 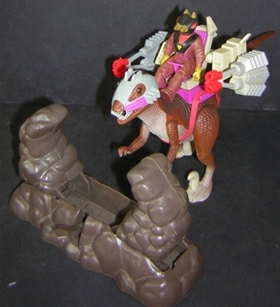 The outfits are otherwise identical, except for a slight difference in the boots. 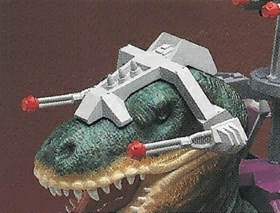 There is a picture of the Series 1 dinosaurs and figures on the back of all the Series 1 cards. 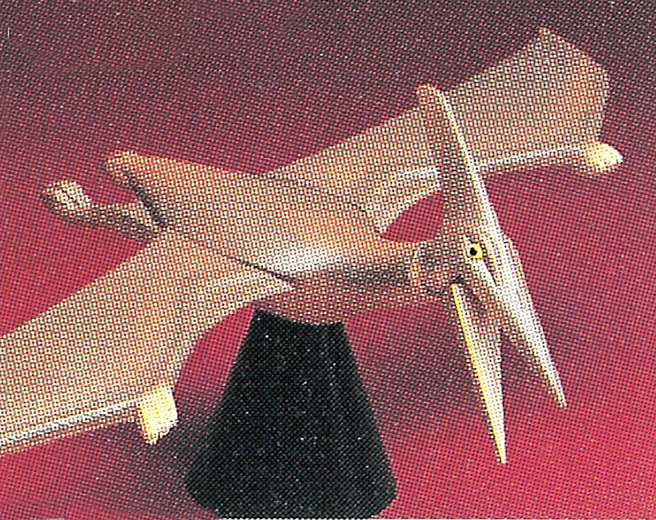 Many of these figures were gold and silver in color and although the actual released figures were also gold and silver, they seem to be a different shade (i.e., not as shiny). 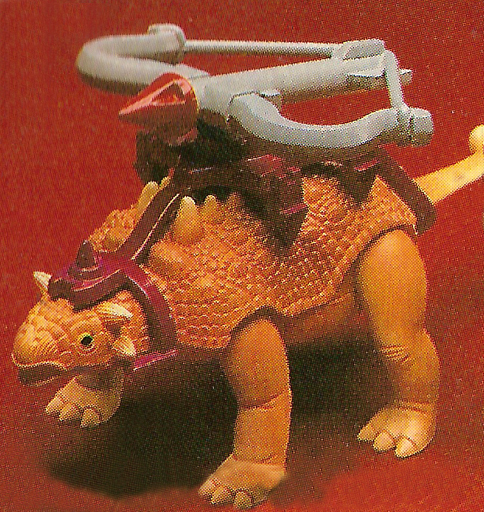 Apart from that, the only one that really varied was Proto. 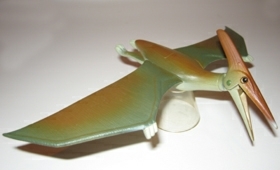 The figure in the picture was silver and teal with a silver tank top. 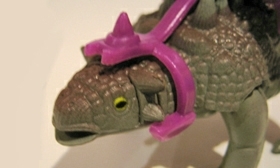 The actual released figure was also silver and teal but had a teal tank top.